ExVeritas specialist in training people to be better, safer and more efficient. We also work with our partners such as CompEx or Wollam to certify people as having specific core competences to do certain specialist tasks (often where such certification is required). It is important for safety and legal compliance to ensure your people are competent to do the work that they are involved in. 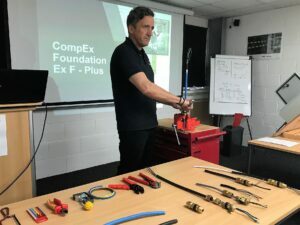 We are accredited experts in the fields we train in and as such have the leading instructors and facilities to ensure you will receive the very best instruction and assessment available anywhere. We are practitioners in the work we teach, we don’t just teach, we have real world experience in design, installation, audit and inspection. We have a comfortable air-conditioned lecture room with HD projectors and audio and up-to-date practical facilities mirroring the requirements of the latest editions of the Standards. We offer hot and/or cold food at lunchtimes and complimentary hot drinks, snacks and Wi-Fi throughout your visit. We offer a wide range of open training at our location sin the UK, Ireland, Malta and Singapore. Open Training is great value for individuals and small groups. Have a number of people in your company requiring Training? Bespoke training may be the most cost effective solution. All courses can be combined and made bespoke for non-open courses, we often run small classes for just two or three people from the same company, it’s a great way to learn and is focused on your products or site! By analysing your company needs, culture and environment we can dramatically reduce the course durations and maximise retention of information. Our trainers have personally delivered ATEX and DSEAR training to the worlds leading Blue Chip companies, our training is truly bespoke and delivered by experts. All of our courses are customised to your exact needs prior to delivery. Complete an on-line quote application form for training courses at your location or block bookings. A Unique ‘hybrid’ service offered by ExVeritas. Do you have a project that needs completing, perhaps a re-design or initial design of an ATEX Product to be designed, Quality System to be implemented or an explosion safety review? Why not combine expert help, training and a completed project signed off by experts? This service has many benefits and is a very cost effective method of receiving ‘on the job’ training and CPD whilst completing real work that benefits your company. Each project is totally customised to your needs addressing both the expected project outcome and the learning needs of the client. Both training and project certification can be issued. We have successfully developed and deployed e-learning courses for large international companies so that field engineers and remote staff can be trained and kept up-to-date. We have developed interactive learning programs with examinations and issue certification based on examination feedback. Please note that we do not offer a standard e-learning range of courses for individuals. We develop the e-learning, for corporate solutions and deployment, as projects based on our current range of courses or research and development.